The St Regis in Monarch Beach provides any wedding photographer with an amazing canvas upon which to create, as was the case with this stunning portrait of beautiful bridesmaids. 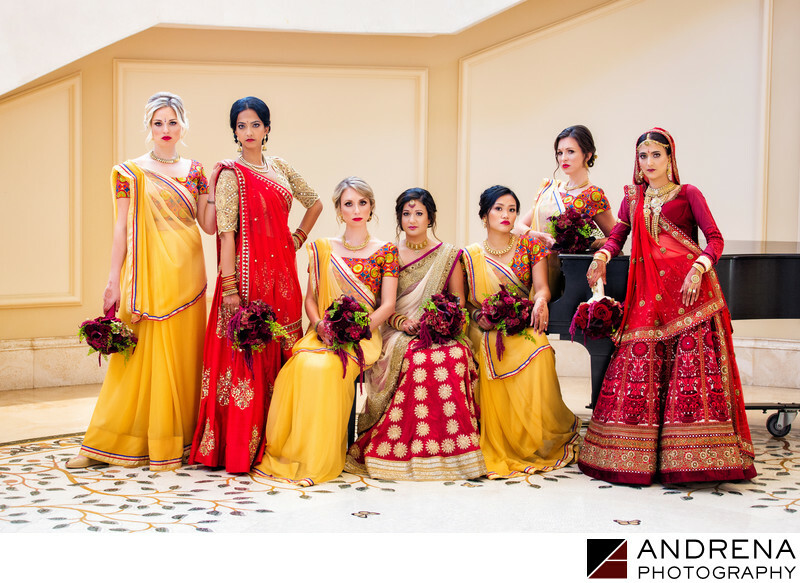 The thing that makes this bridal portrait so awesome is the attitude and pose of the girls. A piano and piano bench served as key posing tools, while bouquets from Square Root Florists added a unifying pop of red to tie in the multi-colored dresses. The bride told me that she was actually hoped for a Kardashian photo of her bridesmaids, and this was exactly what she had in mind. I'm not exactly sure why this pose evokes the thought of Kim, Khloe or Kourtney, but if drama and attitude were the goal, these girls brought it in spades. The great thing about the St Regis is that there is such great light near the grand staircase just outside the Pacific Ballroom. The mosaic tile floor lends itself beautifully to portraits of all types, and the window light is perfect at most every hour of the day. I love the use of dark yellow (or goldenrod) against the bright red. This palette was both attention-grabbing and stunningly photogenic.